Yukarigaoka, a community in the north-central Chiba city of Sakura, isn’t stricly speaking a “new town,” but it was extensively planned. The difference is that the planning was done by a private company, Yamaman, which started out as a fabric wholesaler in Osaka in 1951. They moved their headquarters to Tokyo in 1965 and for the next ten years became a full-scale real estate developer for residential communities. Their first large-scale project was in Yokosuka, a project that was historically notable for being the first Japanese address written in katakana. 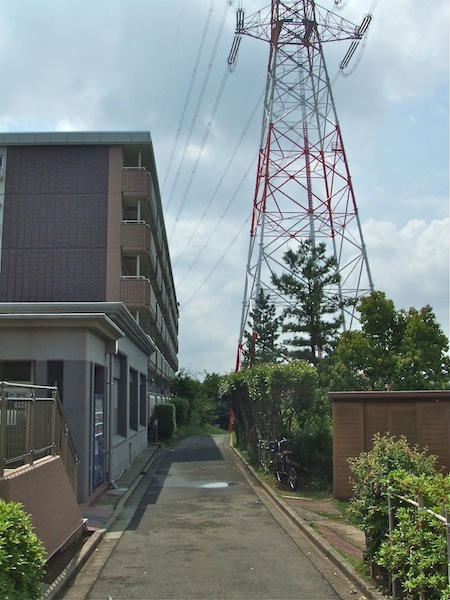 They started the Yukarigaoka project in 1971, and even after the initial development phase was completed, have stayed on for the expansion, which continues today. 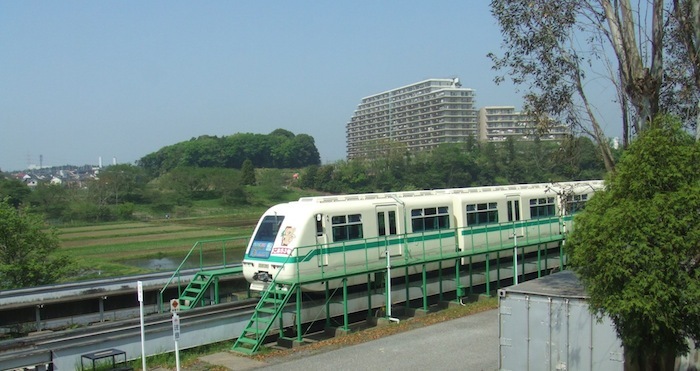 The first sale of single-family homes was in 1979, the first condominium in 1982, the same year they opened a monorail that circled the project and connected to the Keisei Honsen train line. In fact, they convinced Keisei to build a new station just for the community called Yukarigaoka. Naturally, the company had to work closely with the Sakura municipal government in order to purchase land for development, but they also built the area as a community with a future. According to one of the company’s real estate agents, Yukarigaoka is the only similarly sized project in Japan completely overseen by a private company. Because it’s built on a hilly plateau with lots of farmland, the usual expanses of cramped housing developments are broken up by huge swaths of green forests and fields. (Though public parks are relatively scarce.) It has its own “downtown” with a major city hotel and department store complex. There’s even a university with one of the most attractive campuses we’ve ever seen. Yamaman has a hand in controlling the community’s environment by handling the sale of both new and older housing units. As a result, the area continues to be desirable for both older people and younger families. Apparently, many younger people who grew up in the community want to stay, and often buy homes not far from where they grew up. It’s a sustainable, if perhaps inadvertent, model for growth. It also means properties tend to keep their value a little longer, though it’s difficult to tell by how much. The population of Yukarigaoka was 6,470 in 1987. But 2010 it had grown to 15,743. The other condo was simply being represented by Yamaman as the exclusive agent and hadn’t been renovated. The building was newer than the previous one we saw by 15 years but the apartment itself was in disrepair, poorly laid out, and dark despite the fact that it looked directly over a wide valley with no obstructions at all. The person who lived in it previously was obviously elderly. The place had been made “barrier free” in a totally makeshift manner: railings attached haphazardly to walls, cheap sliding doors in place of the original hinged ones, and one wall knocked out to create one large living room where previously there were two smaller ones. This is an idea we’ve often entertained when looking at older properties since too many Japanese residences have too many small boxy rooms, but the renovation work in this case was sloppy. 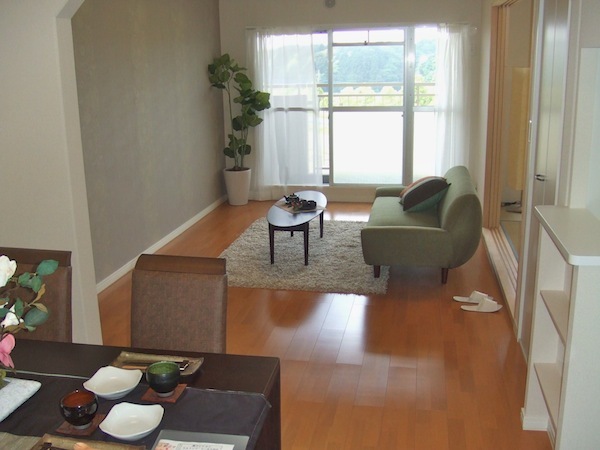 The price was more than ¥13 million, and though it was slightly larger compared to the previous condo it was hardly worth it. The agent knew this but didn’t say anything. It wasn’t as much of a priority for sale as the one his company was selling itself. Also, he knew our preferences even before we set foot in the place. 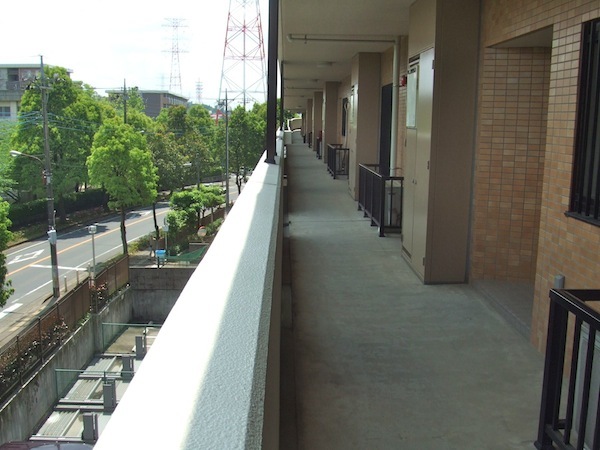 Unlike the other condo, which had a side entrance, this one had the genkan positioned off the outside central corridor, meaning the two bedrooms at that end of the condo also looked out on the outside corridor. We were a lost cause even before we saw the place because we said we didn’t like that kind of layout. Maybe he didn’t like it himself, but he didn’t say anything. Very interesting post. Kind of a minor point in your description but I am in total agreement about that pebbled glass. In our current place (rental 2LDK) all of the windows look out on what would be really great views (we are on a hilltop overlooking a wooded area) yet they all are either fully or partially pebbled so we can`t take advantage of it. Drives me crazy sometimes. Our flat was renewed but it’s totally cosmetic. The walls are hollow and the windows still single paned. Sure, nice shiny floors, a clean bathroom but there is no way that these flats with such minor amendments can retain value. I know that you have written about this before. I would never buy one unless it was really brought into the 21st century beyond the appearance of modernity. I actually like old danchi buildings. Lots of green, no common corridor in front of your window. I lived in danchi in Senri New Town in Osaka. In scale, it must be one of the biggest new towns in Japan. The building I lived in was eleven floors tall but the elevator stopped only on 1F, 4F, 7F and 10F. On those floors there were common corridors and the other floors were accessed by stairs off those corridors. Residents on floors with common corridors had smaller apartments and pebble-glass windows. In my 11th floor apartment I had the full width of the building and windows at both ends. At night in summer I could sleep with a cool breeze and did not need A/C. UR renovated things quite well and gave me back 98% of my 3-month deposit when I left even though I had lived there for 4.5 years ! 98% ! Has anyone ever got that much back from a private landlord ? Thanks for the informative article as usual. We’ve heard that Senri New Town was slated to be totally reconstructed some years ago, meaning the whole project would be torn down and rebuilt, but that financial issues have delayed the work. We’ve seen a lot of older danchi, not necessarily in “new towns,” renovated on an apartment-by-apartment basis, and many were quite nice, depending on the degree of investment. UR usually doesn’t have much to do with for-sale units after the initial sale except for facilities management, though they’ve done good things with keeping rental units up to scratch. What’s gratifying after all these years is that, while a lot of the ole danchi still need work to bring them up to 21st century standards, their designs and layouts are usually superior to those of the current norm for condominiums, which benefit developers more than residents. The only thing they really need in terms of layout is more storage space. I recently visited a friend who lives in a 5 story 8 unit building with commerical (recently closed Lawson) on the ground floor. The building was adjecent to the Senri New Town area which I drove through to get to their place. I have to say that some of the buildings look abandonded or half full at the most. The grass and bushes all needed a good trim. Perhaps many of the people have already moved out. I lived in Senri from Sept,2006 to Jan,2011. In that space of time I saw several older (usually 5 floor) buildings closed and boarded up, then knocked down. They were all adjacent so when the land was freed up a new tall tower was built with elevators and mod-cons. Residents of the demolished units were (as far as I know) temporarily re-housed in vacant UR apartments and then moved back to nice new units in the new towers. One of the nice things about UR is that most contracts are open-ended or roll-over, I don’t know how to put it. There is no re-newing contracts (and the fees that go with it) as per private rental. The UR building that I am living in in Tokyo gave me a lower rent for a 3-year fixed contract. I have to vacate the unit in January 2014. We live in a UR apartment, and previously lived in another. There are a lot of advantages to the UR system, which we outlined in this JT column. Probably the reason you were asked to sign a 3-year contract is that the building is slated for reconstruction. Given that these projects tend to get drawn out, they may offer you another contract after the 3-year one is finished. In such cases, the rent is considerably less than what it would be for a normal UR unit. Thanks for that insight. I was told by a realtor who introduced me to this unit in Tokyo that it was going to be re-built (constructed in 1971) but it was given a 3-month long freshening-up this past winter and neighbors scoffed at the idea it would be rebuilt. That confused me but your idea of a new offer in 2014 seems to make sense. I won’t bank on it till I get it, however. I’ve asked this before and never received an answer. If you are looking to buy a house, why is it that you seem, at least in your blog reports, to be looking only in Chiba-ken? Just happens to be where we live, and the properties here tend to be cheaper than those in Kanagawa or Saitama. We’re open to pretty much anywhere but we don’t have a car or a lot of free time.